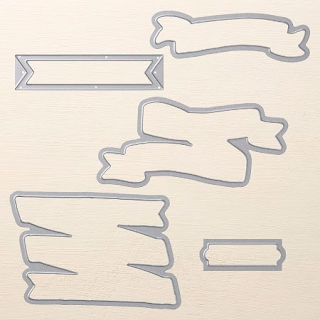 Images & page numbers of the full stamp set & dies shown below the project instructions. 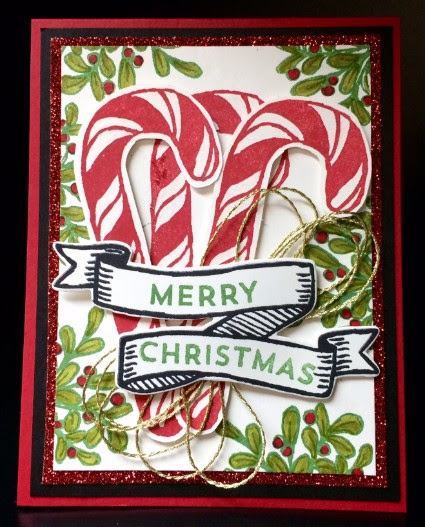 Stamp candy cane with Real Red ink onto Whisper White CS layer piece making sure to center it as though the candy cane was one continuous oval – avoid stamping it so the “stick” part is in the center. It should be off center. Stamp two more candy canes on the two long scraps. Using your Paper Snips, carefully cut out these two candy canes, leaving a tiny white border. 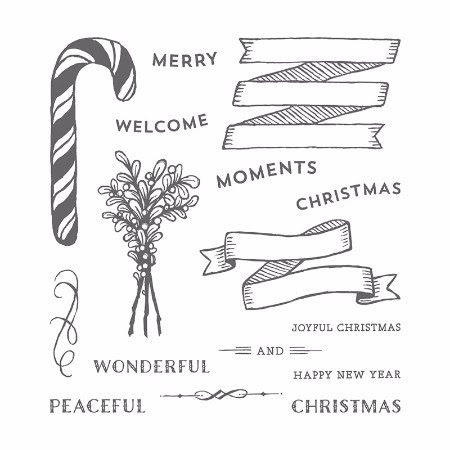 Using the mistletoe branch and Garden Green ink, stamp around edges of main white piece. Using the Real Red and Old Olive markers, color in the berries and the insides of the leaves. Using very controlled and light strokes, brush Wink of Stella Clear onto the white part of all three candy canes. Try not to brush the red parts so it doesn’t bleed. One stroke in each white part is plenty. Also with a light touch brush each mistletoe leaf with Wink of Stella then do the red berries. Set aside. Stamp the banner onto Whisper White CS then stamp sentiment in Garden Green. Cut out with coordinating Framelit. Tie ends of gold twine together with a knot. Wind knotted twine around fingers to create about 5 equal circles making sure to have the knot in the center so it doesn’t show later. Pinch the center of the twine circle to create two smaller loops. Tie that center, where the first knot is, with scrap of any twine you have to create a sort of figure-8. Carefully lay twine behind banner at an angle (leaning right) and use a dot of Multipurpose Glue to adhere it. Allow to dry. Adhere all layers to one another. For the top layer of Whisper White CS to the red Glimmer paper, use Tear & Tape. All other layers, use SNAIL. 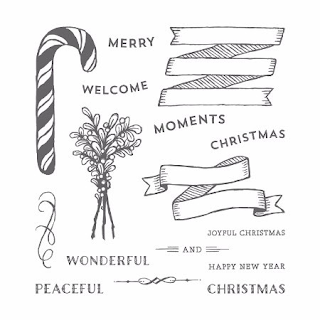 Using Stampin’ Dimensionals, adhere the two candy canes as shown (leaning left or right of center). Also using Dimensionals, adhere the sentiment banner that has the twine attached to the back. Fan out the loops of twine once the banner is affixed to the card.